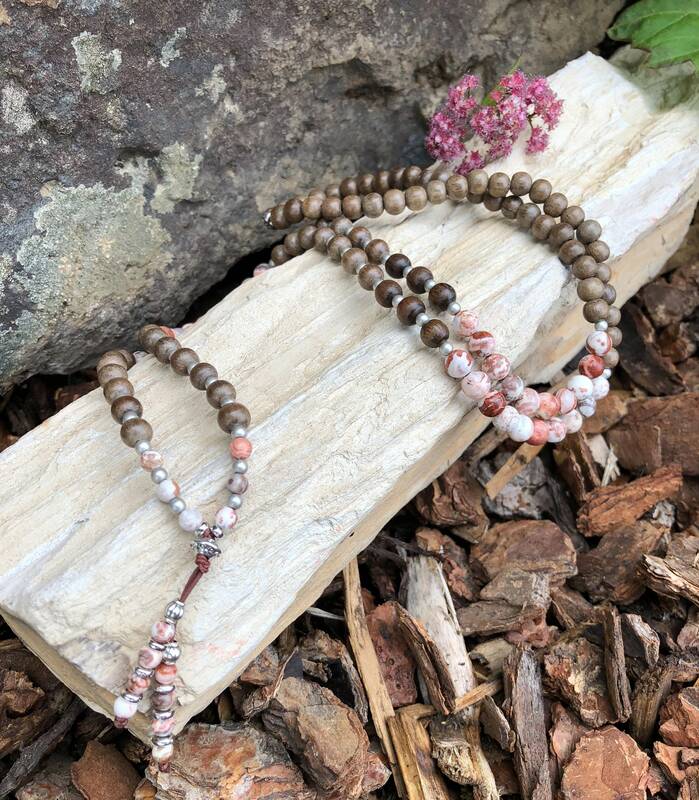 The Happy Heart Mala features stunning AAA Brazilian Crazy Lace Agate gemstones along with natural earthy graywood and a reversible antique silver tone owl bead to heal old emotional wounds so you can live happy and free with confidence and optimism for your future. 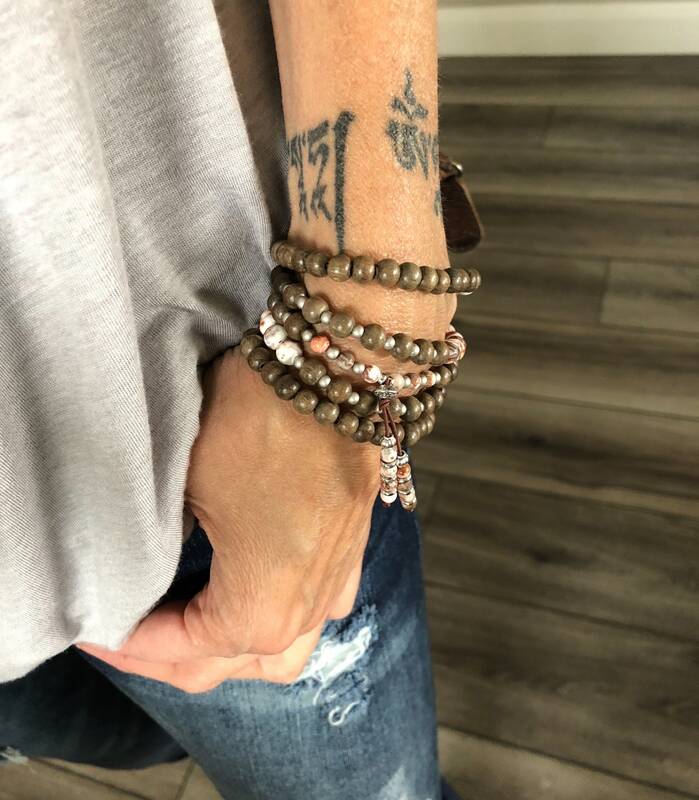 *This lovely stretch mala hangs gracefully around the neck or wraps around the wrist 5 times for a bold bohemian stacked look around the wrist. Crazy Lace Agate is called the laughter stone, or "happy lace." It stabilizes the aura, eliminating and transforming negative energies. Its warm, protective properties encourage wise decision making, stability and self-confidence. Crazy Lace Agate enhances mental function and improves concentration, perception and analytical abilities, leading to practical solutions. It can also absorb emotional pain, heal inner anger and give you the courage to start again. Agate works slowly but brings great strength. It is a light, joyful stone that encourages happiness and general optimism for life. Graywood is a natural earth element that is very grounding and stabilizing. It resonates with the root chakra and will help you feel balanced and connected to your center. 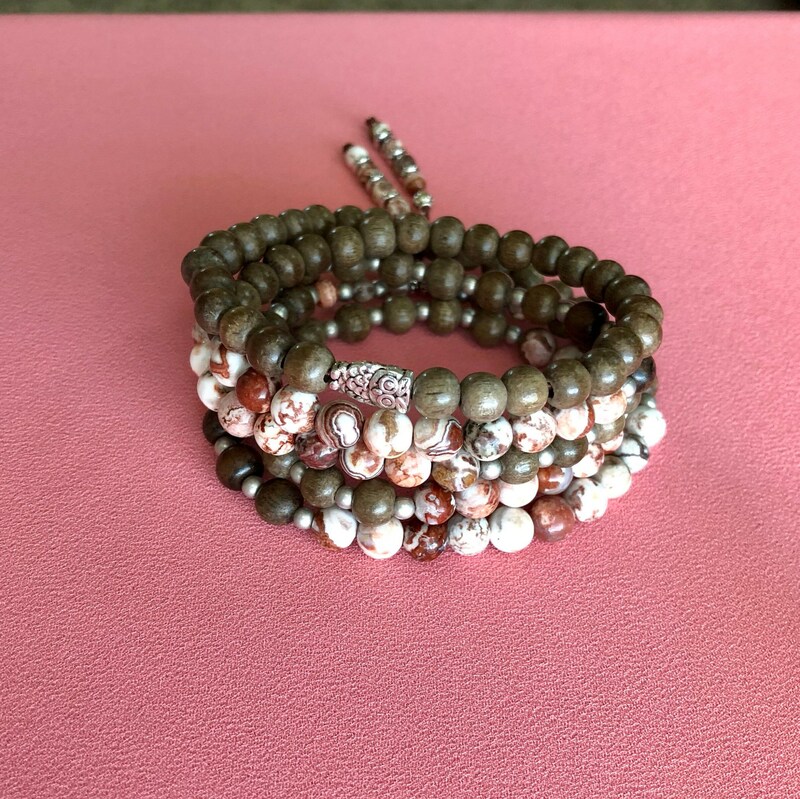 When rolled around in the light, these beautiful light grey beads have a subtle smoky sheen with an understated polish, allowing them to retain a very natural and organic appearance. The Owl represents learning and new awareness. All Sacred Health Jewelry is blessed with sage and infused with Reiki energy, adding another powerful layer of healing. 6mm and 4mm gemstones and natural gray wood, strung on strong elastic stretch cord. One size fits most. Custom sizing is available. Since all natural gems and crystals are unique and different, color may vary slightly. Crystal healing has been used for thousands of years, dating back to the Ancient Sumerians. Each variety of crystal has a unique internal structure which causes it to resonate at a certain frequency. It is this vibrational resonance that gives gems their healing abilities. Crystals and gemstones actually breath in and breath out energy. Each one interacts with the human biofield differently, and can magically move, absorb, focus, direct and diffuse energy within the body. This awakens cells that are vibrating on a lower frequency and brings them back into balance. A healer can then charge a crystal with the pattern of energy she chooses (like an electromagnetic current) to hold specific therapeutic vibrations. Brenda combines her strong energy with the ancient power of Reiki to magnify the natural healing properties of the gemstones. The result is a shift in the body’s energy system, enabling well-being to flow, and a powerful new point of attraction that can help you manifest your deepest desires. Reiki is the ancient Japanese practice of balancing energy. When Reiki energy is infused into crystals, it magnifies the healing power. It actually 'charges' objects with protective, positive energy and increases the effectiveness of a crystal's natural healing vibration. Reiki infused jewelry can then be given as a gift to someone who needs a bit of a boost, or to yourself when you need an extra dose of healing and self-love. Exclusive Original Designs. ©2016 Sacred Health Jewelry. All rights reserved. Is Sacred Health Jewelry Sold Anywhere Else Online? All of our designs, photos and written content are the exclusive personal property of Sacred Health Jewelry. If you see our products, along with our photos, being advertised online from other companies, they are plastic counterfeit copies, low grade replicas or phishing scams. These companies are being investigated for fraud. 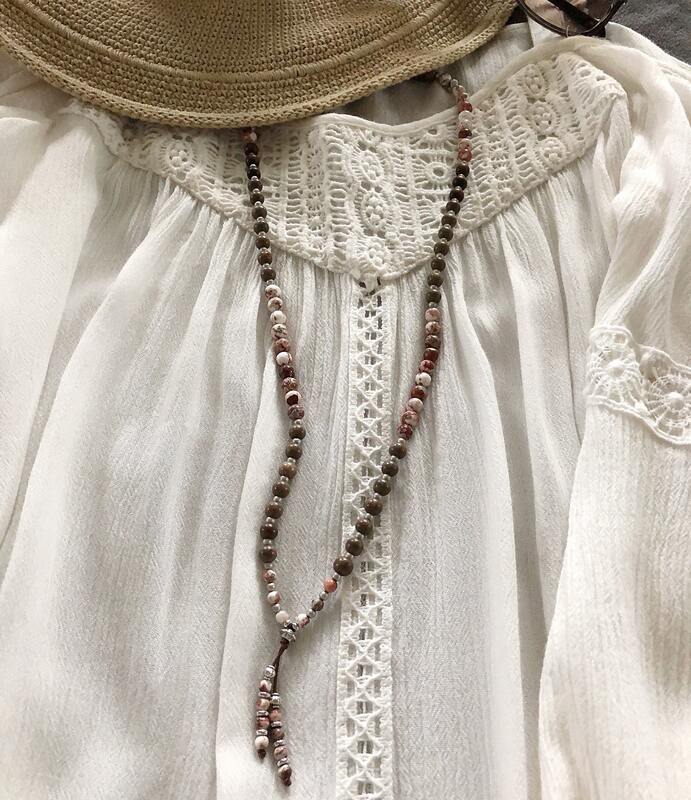 The only places you can purchase authentic SHJ mala beads online (handmade, Reiki infused by Brenda Pharaoh) are at sacredhealthjewelry.com and sacredhealthjewelry.etsy.com. We take our reputation and integrity very seriously. Thank you again for your business. We appreciate you and will always take care of you. ©2016 Sacred Health Jewelry. All rights reserved. How Do I Care For My Mala Beads? 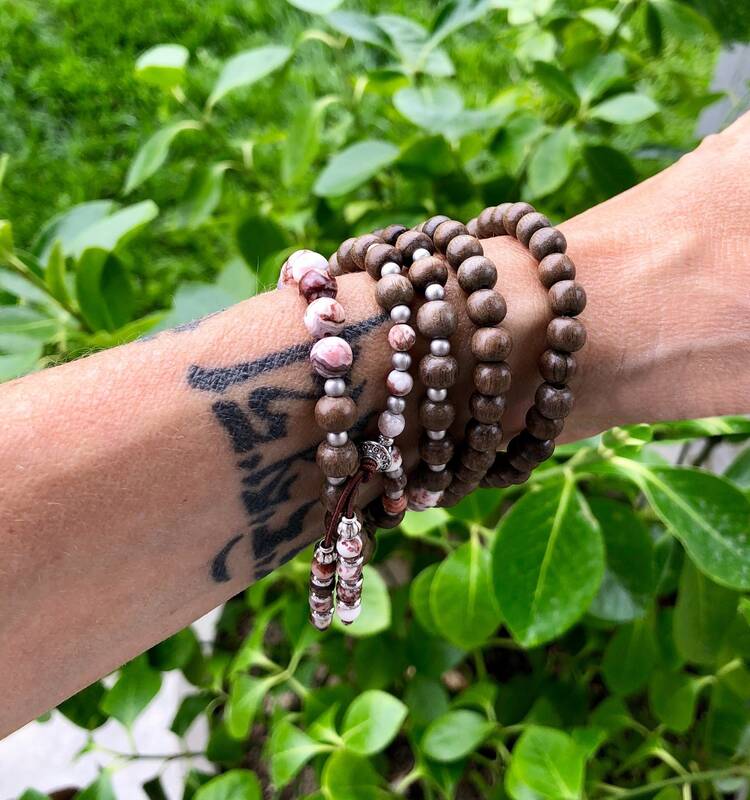 Sacred Health Jewelry has set the standard for luxurious high quality, powerful healing mala beads wrapped with exceptional personal service from the artist. 1. Roll the beads gently over your hand onto your wrist instead of stretching the bracelet apart to put it on. 2. Keep them away from water, including salt water. 3. Remove them before applying lotions or sprays. 4. Try wearing them on your non-dominant hand to prevent accidental snagging. 5. Hold each bracelet over a stream of sage smoke if you’ve just been through something stressful to clear heavy energy. 6. Take them off before bedtime. Am I Guaranteed Results While Wearing Sacred Health Jewelry? While crystals have been used historically to relieve or prevent symptoms, we cannot guarantee a specific outcome. Every person has a different body chemistry and energetic blueprint that may or may not resonate with a particular crystal. Our jewelry is designed to enhance the user’s own energy, empowered by their intention to change or improve themselves. As with any alternative healing modality or wellness therapy, it is based on choice and of course results will vary. Crystal healing should not to be considered as a substitute for traditional medical care. The information found on our website is not intended to be used as medical advice, diagnosis or treatment. SHJ accepts no responsibility or liability for perceived effectiveness. Will I Have To Pay A Customs Fee If My Order Is Shipped Internationally? When a package is shipped internationally, it may be subject to import taxes, customs duties, and/or fees imposed by the destination country. These charges will typically be due once the shipped goods arrive at the country of destination. We are unable to predict which of these fees, if any, will be applied. Usually the fee is minimal, and we think your new mala will be worth it! What Do I Do If My Bracelet Breaks? It is extremely important to us that you love your malas and get years of enjoyment from them! As you know, stretch bracelets are not indestructible. They love being handled gently and cared for like any precious piece of art. They are not fond of rigorous wear, excessive stretching, or being submerged in water. Sometimes a bracelet will literally burst open from all the energy the stones have absorbed. Like anything else, with continued use, there is always a possibility your mala may come apart or need restringing. SHJ offers a one-year warranty on all purchases. Any broken piece will be repaired (and missing beads replaced) at N/C. All you pay is shipping (to and from). Yay! Simply email brenda.sacredhealth@gmail.com to initiate. Can My Bracelet Be Custom Sized? Yes absolutely! It’s important to us that you love your bracelet and that it fits comfortably around your wrist. When you place your order, simply leave us a little note in the ‘Messages’ section at check out with your wrist size and we will accommodate your request. No additional charge. You are also welcome to send us a private message to inquire about the correct size for you. How Does Crystal Healing Work? Crystal healing has been used for thousands of years. Each variety of crystal has a unique crystalline structure which causes it to resonate at a certain frequency. When held or worn against the body, each one (depending on its internal structure) interacts with the human biofield differently, and can magically move, absorb, focus, direct and diffuse energy within the body. An energy healer can then charge a crystal with the pattern of energy she chooses (like an electromagnetic current) to hold specific therapeutic vibrations. Brenda combines her strong energy with the ancient power of Reiki to magnify the natural healing properties of the gemstones. The result is a shift in the body’s energy system, enabling well-being to flow. What Are The Benefits Of Reiki Infused Crystals/Gemstones? Reiki is the ancient Japanese practice of balancing energy. When Reiki energy is infused into crystals and gemstones, it magnifies the healing power. It actually 'charges' objects with protective, positive energy and increases the effectiveness of a crystal's natural healing vibration. Reiki infused jewelry can then be given as a gift to someone who needs a bit of a boost, or to yourself when you need an extra dose of healing and self-love. Crystal healing /vibrational therapies are not to be considered as a substitute for traditional medical care. Our website information is not intended to be used as medical advice, diagnosis or treatment. While crystals have been used historically to relieve or prevent symptoms, we do not guarantee a specific outcome. All of our website content and customer conversations relating to the emotional, mental & physical healing properties of crystals are from our own personal intuition and the result of our own extensive education and research. Individual results will vary. In no event shall SHJ be held liable for any indirect, consequential, incidental or punitive related damages related to the content, errors or omissions of this site. How Can I Schedule An Energy Therapy Session / Clairvoyant Reading With Brenda? Brenda is currently scheduling private sessions in Meridian, Idaho by appointment only. She does not offer phone services at this time. The current wait time is a year and a half, into the year 2020, but it is well worth it! To schedule a Shamanic Reiki energy therapy treatment and clairvoyant reading, please contact brenda.sacredhealth@gmail.com for available dates/times. Visit sacred-health.com for more detailed information.